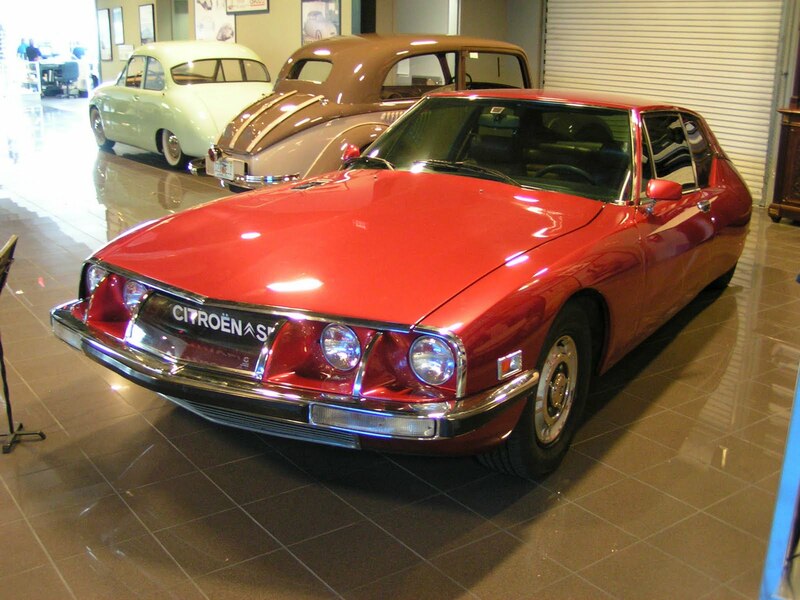 The SM was the most tangible result of Citroen's short lived ownership of Maserati. The car combined the pinnacle of Citroen hydraulics with a glorious Alfieri designed Maserati V6 engine all combined in an spaceship like body designed by Robert Opron. Structurally the monocoque was a further designed version of the DS with two massive arms swooping forward from the cabin, holding the engine and the front suspension, this time with trailing arms rather than the leading ones as used in the DS. Almost anything possible was supported by hydraulics, the suspension, brakes and the steering but also the inner of the three front lights could be hydraulically turned and leveled. The 2.7 litre 90 degree V6 in the first bunch of cars was fitted with three twin-choke Weber Carburetors, which proved to be troublesome. By mid-1972 the Webers were replaced by electronic Fuel Injection, an option which many owners also applied as a retrofit. Interestingly the engine bay was already so filled up that the control unit of the EFI had to put where the glove box used to be. The automatic equipped version of the car had a three litre version of the engine. The power steering was self centering, requiring some getting used to, while also the directness of steering increased with speed, resulting in fingertip movements while cruising at speed on the motorway, where the fuel injected versions could reach more than 140 mph, thanks to the slippery shape of the body. Like so many supercars built in the early seventies the car fell victim to the first oil crisis and production stopped in 1975. In an interesting comment made earlier this year in Classic and Sportscar it is mentioned that at least nobody would mistake you for a football player when driving this car. Among the many celebrities that owned one in its time was no other than Johan Cruyff, which arguably counts as one of the greatest players of all times.